Flexible and integrated security solutions that help protect your people, property and assets. Lenel’s OnGuard® security management system exempli es our commitment to providing you with a superior, integrated, customizable security system that meets your evolving needs. With over 20,000 installations sold in 90+ countries, the OnGuard system focuses on delivering solutions that seamlessly integrates access control and video for a variety of industries. Through OnGuard, Lenel continues its ongoing commitment to nding new ways to facilitate data optimization and enhance security and business operations. Incorporating responsive technology, the OnGuard system delivers an array of functionality, while also accommodating future enhancements. By continuously evolving our feature set and open architecture, we provide innovative, technology-rich and robust software security options to businesses around the world. Providing the means to aggregate, visualize and share security data from multiple sources, the OnGuard system helps companies recognize context and analyze input from a number of simultaneous events. Seamlessly synthesizing information from access control, video and other sensors, the OnGuard system delivers complete line-of-sight to all aspects of security, and facilitates intelligent responses and outcomes. The OnGuard system integrates seamlessly with existing business systems. The OnGuard system can bi-directionally exchange cardholder data with HR platforms and/or ERP systems, coordinate alarm/event data with emergency response systems, and provide/receive event information with building management, network management and third-party security systems. Adaptable and scalable, the OnGuard system is appropriate for small localized environments and large global enterprise applications that span a wide geography. For businesses starting small and anticipating growth, the OnGuard system is ideally suited to meeting their expanding needs. For unlimited scalability, flexibility and industry- leading performance, the OnGuard system is built to deliver. With the Lenel Open Access Alliance Program (OAAP), Lenel provides manufacturers across a variety of product categories with the opportunity to develop a software interface for the OnGuard system. Since 1999, this program has continuously incorporated third-party solutions and now includes over 150 active partners who undergo a rigorous process to ensure system compatibility. With well documented APIs, the OnGuard system allows any manufacturer to develop an OnGuard software interface, so it can be incorporated into any of the 20,000+ OnGuard systems installed worldwide. By choosing an OAAP-certified integration to OnGuard, you can be con dent that the integration meets Lenel’s standards for compatibility, performance, and reliability. Third-party providers offer a variety of Lenel- certified products and integrated solutions– helping provide the flexibility to customize the ideal system for each application. The OnGuard system provides integrated security solutions for many of the most respected and innovative global companies. OnGuard’s open architecture design seamlessly integrates with a full suite of security management technologies tailored to meet each customer’s specific security needs. The complete Blue Diamond Mobile offering includes the Blue Diamond Mobile smartphone app, Blue Diamond Mobile BlueTooth®/RFID readers and Blue Diamond Mobile credentials, all tied together by the cloud server. These components tightly integrate with Lenel’s industry-leading OnGuard® security management system, allowing seamless issuance and management of mobile credentials. OnGuard automatically emails a badge invitation to the cardholder and sends the badge number information to the Blue Diamond cloud server. The user receives an email with a link to download the Blue Diamond Mobile app, as well as an authorization code to activate the credential. At the same time, OnGuard automatically sends the user’s badge number and access assignments to a Lenel controller. The app authenticates to the reader, and the OnGuard Badge ID is transferred to the access panel. Authorization is granted or denied by the Lenel controller based on OnGuard access levels. With a single click, the OnGuard administrator issues a virtual credential to a user. As the user approaches an access point, readers are detected and displayed on his or her smartphone or watch. The user taps the desired reader icon to show intent to enter that door. 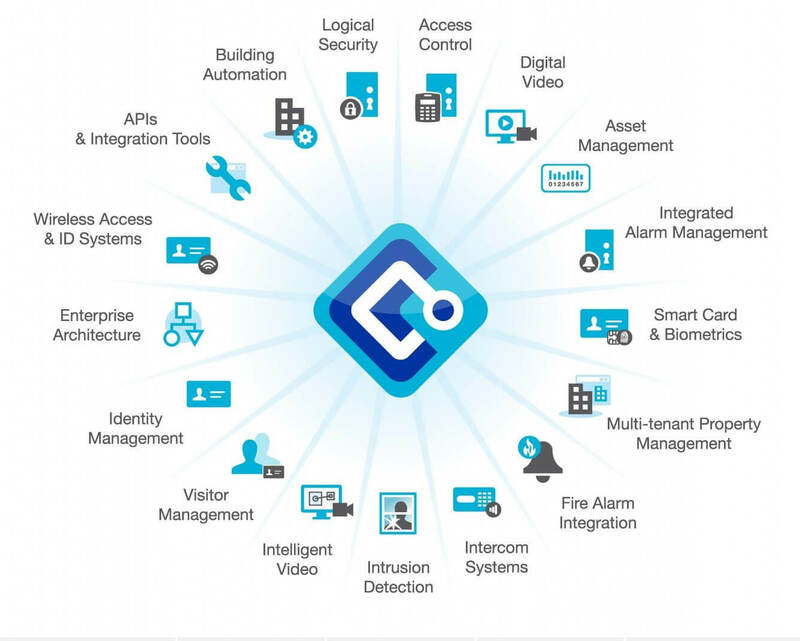 The ever-evolving portfolio of OnGuard Modules is designed to integrate seamlessly with the OnGuard system, providing added functionality and streamlined management of your entire security system. In addition, intuitive controls and user-friendly interfaces simplify operations to help ensure quick and effective responsiveness to security incidents. Featuring new enhancements, like web-based apps and support for mobile credential issuance, the latest software also supports the new Lenel® Console. Modern and responsive, Lenel Console is a web-based application that ties core, web-based and third- party components of the system into one unified launch pad for enhanced performance, convenience and operational efficiency. Dependable, cost-effective, browser-based visitor management to manage and track visitors in all facilities via standard desktop technology. The app allows existing cardholders to request access to enterprise locations for which they lack authorization. The area supervisor/manager can access the app via a computer or mobile device to view and act on requests quickly and conveniently. A browser-based analysis tool that permits users to configure OnGuard system to assist in enforcing corporate security policies. The app works with the OnGuard Access Control System and allows pre-authorized facility visitors to check in and out unassisted, sign necessary documents and optionally print a badge using an iPad® tablet. Based on Lenel’s responsive user interface design, this browser-based app provides a flexible alternative for OnGuard users responsible for managing people and their access rights. OnGuard WATCH (Web Access Trending and Comprehensive Health) is a web- based dashboard that provides users with a detailed overview of their system and allows them to easily view important security data. Video solutions for the OnGuard® system deliver the technologies you need to protect your most important assets. Whether it’s monitoring a single door or multiple properties, video solutions for the OnGuard system can be tailored to meet your specific security needs. Built using an innovative open-architecture platform, video solutions for the OnGuard system provide the ultimate in flexibility, reliability and scalability. Offerings include simple stand-alone options along with robust integrated enterprise solutions featuring advanced surveillance technologies. Including advanced features such as alarm integration, investigative analytics, event-driven recordings and total system management, the advanced features of the OnGuard system are designed to meet your current and future security requirements. Lenel offers a variety of video management solutions tightly integrated with the OnGuard system and ideal for any size deployment. Integrations with many third-party VMS systems are also available. OnGuard Video Manager provides event-driven viewing and integrated alarm management. Video Manager has the scalability to grow small, simple video systems into large, sophisticated enterprise video con gurations. The Prism mobile app integrates seamlessly with Lenel’s security management system, allowing the remote monitoring of live and recorded video surveillance via Apple iPad®. Lenel’s Prism is an open IP video management system based on an advanced, intuitive and operator- friendly user interface. Designed and built using the latest IT and video surveillance technology, Prism integrates seamlessly with the OnGuard system for reliable, event- driven monitoring. Lenel’s Network Video Recorder (NVR) provides a shared software technology platform that supports the streaming video capabilities of OnGuard Video Manager. Delivering the ultimate in flexibility, Lenel NVR empowers you with the freedom to choose the hardware and software solutions that best suit your unique security needs. With advanced features and user-friendly operation, Interlogix TruVision recorders enhance the OnGuard system with effective video capture, storage and retrieval. At Lenel, we are committed to providing our customers with a world-class open-platform security system, backed by world-class service and support. This level of dedication is designed to optimize the performance, flexibility and effectiveness of every OnGuard security management system—both now and in the future. Lenel’s Advanced Services team provides insights and expertise in access control and video management. With access to a diverse portfolio of services, our experienced team delivers custom solutions tailored to meet your specific security needs. Lenel’s Professional Engineering Services provide experienced, specialized support to help ensure the success of complex installations of every size. Lenel’s Custom Solutions team designs, develops and delivers customized access control software solutions for corporations worldwide, including financial institutions, universities and government facilities. Lenel’s Remote Managed Services team provides regular maintenance and diagnostic services to help ensure your OnGuard system runs efficiently and cost effectively. Lenel’s Embedded Services provide dedicated technical advisement and project support, and will help to identify operating inconsistencies across your Lenel OnGuard system and opportunities for optimization. Lenel provides a full complement of training programs at its educational facilities around the world, including online courses, eLearning programs, and a factory- certification training program. Whatever your educational goals, Lenel has programs to help you achieve them. Lenel is committed to providing you with the best possible user experience, whether you’re new to the OnGuard system or are upgrading your existing system. Experienced technical support provides the highest level of product support. Comprised of specialized teams of experienced security and IT experts, Lenel’s Technical Support group is dedicated to ensuring your complete satisfaction with your OnGuard system and to addressing all questions and concerns promptly and professionally. Lenel offers a Software Upgrade and Support Plan (SUSP) with options that make upgrading your OnGuard system and Lenel video system simple and cost-effective. This simplified plan lets you take advantage of pricing benefits, along with Lenel’s outstanding technical support to guide you through the upgrade process.